As he was confident in himself that he had well researched about the coal-fired power plant in all aspects, including pros and cons, Prasitchai Nu-nuan usually came out to oppose the construction of the coal power plant, especially in the South. Prasitchai became well-known for the first time in the nationwide on July 2015 when he and Akaradech, his friend, launched a hunger strike at the Ministry of Tourism and Sport demanding for the cancellation of the coal-fired power plant project in Krabi, hoping that the government would listen to the local people who are affected from this project. Even though the Head of NCPO stated that the hunger strike might be a deception, but Prasitchai insisted to fight by this way because it was a form of the peaceful protest. After having carried on the hunger strike for 14 days, the government consented to establish a committee consisted of three components including the government, the EGAT, and the anti-coal power group in order to research that whether the South has enough the electricity to utilize. After having done the research, it was found that the South of Thailand had enough electricity for its need, and it also had an optional energy source which was cleaner than the coal power. On the other hand, it turned out that the coal-fired plant power project still carried on. Prasitchai and the local people who were in trouble from this project would protest again on February 2017 at the Office of the Public Sector Development Commission (OPDC). For the main purpose of this gathering, the protesters claimed to the authorities is that “ We have the right to protect our life, the environment and our descendants in the future.” This protest cause Prasitchai and his peer to be arrested for 'attitude adjustment' in the military camp for a night. 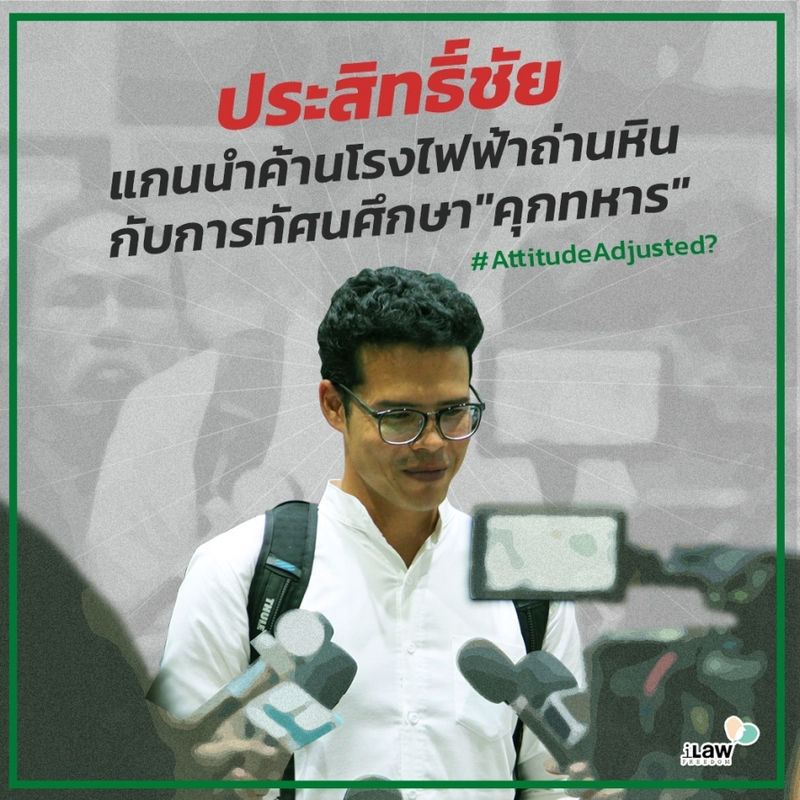 This was the second time that he was summoned for the attitude adjustment, and Prasitchai felt that the NCPO treated him harsher as a dissenter against the government policy. Prasitchai recounted about his first time of the attitude adjustment that after four months of the military coup, the Energy Reform activists (the group of people making a movement and attempting to make the petrol resource become the property of individuals, which has the fair price and seeks the development of using the clean energy) had marched from Hat Yai to Bangkok in order to call the government to have the energy reformation. On 19 August 2014, the first day of marching, the officers came to talk and deterred the march because they were afraid that other people would come out to protest as well. However, the energy reform group insisted to contunue walking. On 20 August 2014, in the morning, there was a negotiation again. The offices still did not allow the group to walk, and the ISOC officers kept observing and following the marching group. During lunchtime at a petrol station, a military Colonel and privates came to negotiate and asked them for stopping the movement. Nevertheless, the officer did not inform that their movement violated which law. Later, the officers brought a vehicle and arrested him as well as his nine friends to the 42th military circle (Koh Hong military camp) in Songkhla district. They were forcibly stayed in the camp around 4 days. When they had arrived at the camp, soldiers forced Prasitchai to fill out his background information. Initially, the officers did not seize their personal belongings or phones. On the second day, in the military camp, the officers seized phones as well as chargers and separated each detainees to stay in different rooms for having no talk. The detainees would meet each other when they had meals. The detention room was similar to an apartment. In each day, the officers would talk to them, or in other words, it was “the attitude adjustment” once a day. Prasitchai told that on the first day, in the military camp, the officers allowed acquaintances and a lawyer to visit the detainees. The officers let the detainees meet their relatives or the lawyer one by one, for avoiding talk among the detainees. On the day two, the supervisor guided him to visit the military prison, and he described how many types of the prisoners in the military prison and how each type of the prisoners are punished. Prasitchai remembered that in the lecture room where he stayed, he could see the military prisoners were punishing, but the officer did not take him to look at that area. In the following day, the day three of the detention, he did not do many activities, but the officer talked to him for once. In the fourth day, the last day of the detention, Prasitchai and other detainees discussed with the 4th Army Area Commander, the Commanding General, and the Chief of Staff about the petroleum and coal. The soldiers still insisted that their method was right, but our method was wrong and said that the government was attempting to reform. After discussion, the soldiers told Prasitchai to calm down, and they would not charge with any criminal offenses. They would let them free without any legal accusations, but they asked for one thing, Prasitchai and peers must not do any activities. Prasitchai recounted that after having such talk, he must sign an agreement, but he had no idea what the agreement was about. Before leaving the military camp, there was a health check-up for the detainees. After being released in that day, the soldiers did not follow him anymore. However, on July 2015, he launched a hunger strike in Bangkok. The soldiers went to his mother’s house in Pattalung. His mother was very shocked as the soldiers never visited at her place before. The soldiers had talked with his mother shortly and said they just want to visit and talk with her. The conversation between his mother and the soldiers seemed usual, but it was unusual. Prasitchai recounted about his second round of the attitude adjustment that on February 2017, the National Energy Policy Council which had the Head of NCPO as the president discussed about the construction the coal-fired power plant in Krabi Province. At noon, the council decided to proceed the construction of coal-fired power plant. Prasitchai and the Protect Andaman from Coal Network thus invaded and occupied the area near the fence of the Government House which was opposite the Office of the Public Sector Development Commission (OPDC). From this situation, it caused anxiety for the government. The police attempted to disperse the crowd by using negotiation and position forces. In that day, the Police Chief, Jakthip Chaijinda, had taken control in this area himself. After having done the meeting inside the Government House, Police General Jakthip came out from the gate of the Government House where the network occupied the area. This gate was not usually use, and when the police opened the gate for the Commissioner-general’s car to come out, the protesters were pushed to other sides. After the car had gone, the area was still under controlled. Prasitchai told that at that time, two groups of people were attempting to arrest him and Akaradech, who was another organizer, but he was aware before and reproach them. In the evening, there was a blockage from the Phanitchayakan Intersection to the Makkhawan Rangsan Bridge; it did not allow any cars enter and did not allow to deliver food and water in the protesting area, and the officers shut down the restroom at the OPDC building. During the night, the network had to build its own restroom. General Apirat Kongsompong, the 1st Army Area Commander, privately negotiated with Prasitchai; General Apirat Kongsompong asked him what he wanted because the policy of constructing the coal-fired power plant had been declared already. Prasitchai replied that previously, we discussed already about the unjust report. Thus, General Apirat gave his word that he would discuss with General Prayut Chan-o-cha and ask us for dispersing the crowd. Nevertheless, the promise was unable to guarantee anything. In the morning, Pol.Lt.Gen. Sanit Mahathavorn, the Metropolitan Commissoner, came to negotiate with the protesters and asked the protester to move to the OPDC side. After discussion within the network, we agreed to move to the OPDC side, and then we saw a large group of police. Thus, at that time, we were ready to be arrested. Then, Prasitchai, Akaradech, Mom Luang Rungkun were arrested and taken to the 11th military Circle. When they were there, the soldiers seized all communication tools, forced them to fill out their profile information, and talked about the activities in the military camp involving the rules, the way that soldiers will treat us, the schedule for eating and sleeping; the soldiers explained every single step for them. Then, the soldiers took three of them to the room which had partitions dividing them to sleep separately, and for the restroom, they can use the restroom in the near meeting room. Prasitchai told that after seeing the bedroom, they were forced to attend in the process of attitude adjustment. Lt.Gen. Sansern Kaewkamnerd, the spokesperson of the government, the Deputy Permanent Secretary of the Ministry of Energy, the Deputy Governor of EGAT, the Director of the Office of Natural Resources and Environmental Policy and Planning (ONEP), and two government officers discussed with three of them. The officers talked with them, one by one, and the discussion session had spent time for 40 minutes per person. Prasitchai described that in the discussion room, there was a round table, and he sat there with lieutenants watching over him, and Lt.Gen. Sansern acted as a referee. Prasitchai has perceived that this discussion was the real 'attitude adjustment' process, comparing with the first round of the attitude adjustment in year 2015 which he said that the discussion did not dominate him, but this one was really the attitude adjustment. The government compromised and persuaded him to accept the coal-fired power plant and said that at present, there was a clean coal technology already. Prasitchai mentioned that during the discussion, the Director of ONEP raised his hand and seemed to point finger at him and said “ You were suspicious.” Then, “So, you are suspicious as well” he pointed his finger back. The situation in the room started to be tense. Lt.Gen. Sansern seemed to compromise, but he talked too much and always interrupted while Prasitchai was explaining. He taught and said that doing this thing was incorrect. After finishing the attitude adjustment, the soldiers took them back to the bedroom. During nighttime, after finishing the attitude adjustment, Nitithorn Lamlua also known as Nok Khao lawyer contacted with soldiers in order to talk with the three of detainees. Prasitchai mentioned that he did not contact Nitithorn to meet him at the 11th Military Circle and did not aware that he would come. However, during the break session, the soldiers took the detainees to a van, blindfolded them, and drove to another building. Prasitchai thus met with Nitithorn; Nitithorn explained that he was coordinating with the soldiers. Nitithorn told him how people outside were and asked him to sign the three parts in the same agreement which he did not remember what the agreement was about. Prasitchai said he did not care for assistance since he had known that General Apirat, the 1st Army Area Commander, ordered by the Head of NCPO to be in charge of this situation, was authoritarian and the decision maker. Prasitchai recounted that when he had finished talking with Nitithorn, the soldiers took him to the bedroom. In the morning, General Apirat summoned him, and there was Lt.Gen . Sansern participating in the discussion. Lt.Gen. Sansern told that the Head of NCPO accepted the offer to cancel the EIA report. General Apirat had already discussed with General Anuntaporn kanjanarat, the Ministry of Energy, and General Anuntaporn would bring this cancellation to the cabinet. Prasitchai thus agreed and would end the protest suddenly. General Apirat also told him that if the protesters would not go back, the soldiers would disperse the crowd, because of finding that some agitators disguised themselves in this protest, and Prasitchai understood this reason. At around 9.00 a.m. the three detainees signed the agreement which had the similar content like the first round of the attitude adjustment by having no any conditions or accusations. Doctors had visitted to provide a health-check as well before they left. The soldiers took three of them to the Makkhawan Rangsan Bridge for announcing to the protesters that the EIA was cancelled, and the protest must end. Nonetheless, afterward, the problem remains because Prasitchai found out that the cancellation of EIA was not brought to the cabinet as the representatives of the government and the NCPO gave their word. They distorted the statement that there was no cancellation of EIA, but it was just a review. In the legal term, the cancellation and the review were completely different. Therefore, Prasitchai declared on his Facebook that if there was no cancellation, we would protest again. In the following day, General Apirat called him and said that he was performing, and in that night, the ONEP suddenly released the termination of EIA the coal-fired plant power in Krabi.